Experts at Farsight are consistently monitoring trends in the construction & staffing industries, and recent data is pointing towards a shift in the recruitment market. In short – we are witnessing a steady transition from a vacancy driven market to a candidate driven market. Since a peak in 2009, where competition for jobs was at a decade long high and employers were spoilt for choice, there has been a steady move towards a market place where there is a skills shortage and candidate is king (well, the good ones anyway!). Statistics from a recent study show 86% of recruiters agree that 2016 has seen a definite move back to an employment market where candidates wear the trousers. Further evidence came from a report that 31% of recruiters have experienced candidates rejecting contracts due to better offers elsewhere. (source: MRI Network Recruiter sentiment study 2016). Farsight CEO, Tom says, “We’ve seen this happen a couple of times in the last decade. Foreign investment and affordability of housing are two of several factors that mean the construction industry is one of the first to react when there is a change to the wider economic picture." The demand for quality staff is good news for skilled construction workers who, in theory, now have a wide range of contracts to choose from, and some decent bargaining power when negotiating pay rates. The shift does present some challenges for construction companies; increasing labour rates and competition for the most skilled workers means submitting accurate tenders and controlling the build costs can be tricky. Employers are left having to compete to secure the best talent on the market. “This is where we see the companies who have promoted strong relationships with candidates really rising in influence. Often the businesses that have squeezed and mistreated their workforce will see their lack of investment in meaningful relationships in the search for quick profits backfiring now the boot is on the other foot. “We’ve seen trades & labour rates increase by upwards of 50% in the last 2 years, which is a big deal for any company looking to provide a quality service and value to their clients," States Tom. In 2008/2009, the ratio of jobseekers to vacancies was almost 7 to 1; meaning there were an average of 7 unemployed individuals competing for each job opening. As Chart 1 shows above, by July 2015 it was a very different story. 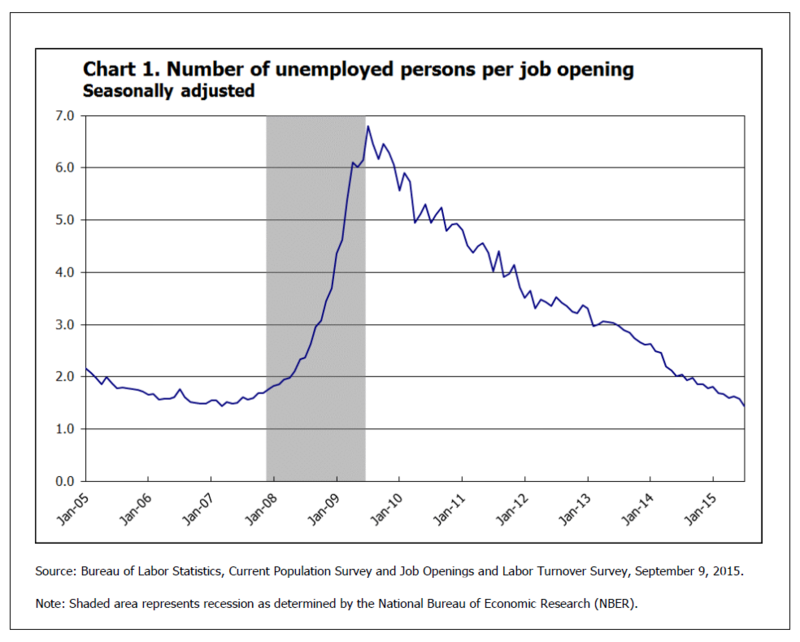 Today there are only 1.4 unemployed individuals for each job opening. This number is continuing to fall every month, and is forecast to continue doing so. Tom says “If you’re an employer working in the UK, it’s vital that you consider these changes and if necessary adapt your recruitment strategy. Any business is only as strong as the people it employs." Fortunately, the long term management focus on candidates means Farsight are very well positioned to prosper in this environment. Lasting relationships allow for consistent provision of the most efficient and reliable candidates, right across the UK. Always looking to stay ahead of the game, Farsight are focussing on a drive for more quality candidates in the coming quarter. all good very proffesional company and all very compotent.